In 1770, the Royal Fusiliers were in dire need of new accouterments. Lord Robert Bertie put his regimental agent to work refitting the regiment. A document in Bertie's papers details the changes undertaken at the time. It appears that some of the accouterments were still fit for service, but were in need of updating to meet emerging military fashion trends. The waist belts of the regiment appear to have been made of buff leather, but were fitted with belt buckles. 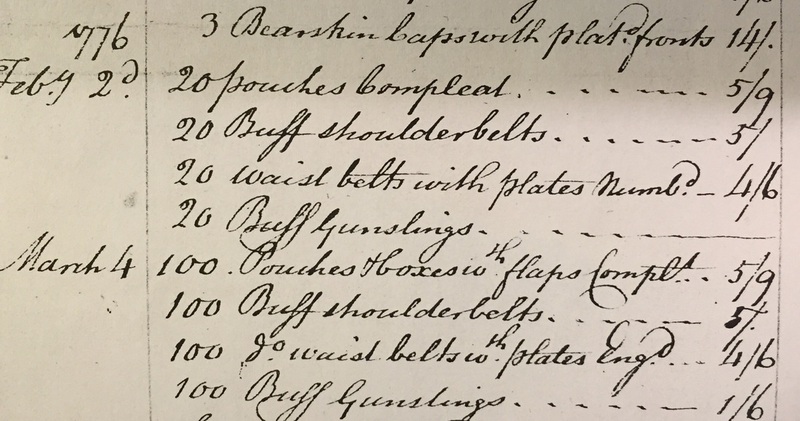 In January of 1771, Lord Bertie paid for 150 brand new sets of buff accouterments, as well as altering 200 existing sets by replacing the buckle with an engraved belt plate. There appears to have been no difference between the waist belts and plates issued to the Sergeants and Fusiliers at this time. 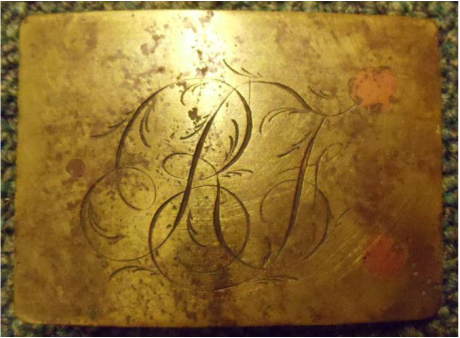 Both cost 4s/6d each and both had engraved brass plates. Exactly what was engraved on the plates has been the subject of speculation by some. However, a document dated to June 29th, 1776 sheds more light onto the situation. The regiments of the British Army were augmented with additional soldiers in 1775 in response to the growing hostilities in America. Lord Bertie purchased additional accouterments to equip these men. Between September 11th of 1775 and May 23rd of 1776, 179 new sets of accouterments were ordered. Rather than simply listing engraved belt plates, this time, they list "waist belts wth plates Numberd." This is a solid indication that the plates worn by the 7th regiment up to this point were engraved with either an Arabic "7" or possibly a Roman Numeral "VII." The majority of the accouterments were captured between October and December of 1775 when most of the regiment surrendered. Only about 80 sets survived in regimental hands. These belonged to the detachment under Captain Owen who participated in the successful defense of Quebec. It is most likely that when these men were drafted into Burgoyne's Canadian Army in May, 1776, these accouterments went with them. There are a number of references to the arms, uniforms and accouterments of the 7th being issued to Rebel soldiers. It is therefore very unlikely they were with the Royal Fusiliers who were exchanged in December of 1776 to New York City. No examples of the early pattern belt plates are known to exist at this time. However, a number of Long and Short Land Pattern muskets marked to the regiment do survive and are provenanced to the Rebel Invasion of Canada. these muskets are all marked "7th Regt", leading to further evidence that the early plates were likely marked with an Arabic "7." Detail of the June 29th, 1776 dated receipt from Alexander Mackintosh detailing the accouterment purchases. Bertie Papers, BRO D/ED 038 bdl 3. After the survivors of the regiment were drafted in Quebec, the 7th was being rebuilt in New York City. Once it was decided not to draft the remainder of the regiment and the returned POW's, Lord Robert Bertie made a mass purchase of new accouterments. On June 6 of 1777, He purchased 238 sets of "[buff] Wasitbelts & Plates ingraved in a Cypher" at the cost of 4s/8p each. As the regiment was augmented with more men, on November 22, 146 additional waist belt with plates were ordered. We are fortunate that one of these belt plates survives in the NYHS. Some regiments opted to purchase cross belts for the rank and file. Others, like the 7th, continued to issue waist belts to the rank and file of both the Battalion and Grenadier Companies. The Sergeants of the Grenadier Company each received one of the "3 [Grendr. Sergt's buff] cross belts & tutge (Tutenag) plates ing[rave]d." at a cost of 9s each. The Battalion Company Sergeants each received one of the "27 [Battn Serjt buff] cross belt & Tutge (Tutenag) plates ing" at a cost off 9s each. Unfortunately, it is not known exactly what the plates issued to the Sergeants looked like. They may have been oval, as they were worn on a crossbelt, or they could have been simply zinc versions of the same plate pictured below. Helyar's Company interprets it as the latter. Interestingly, there is not a single sword purchased for the Sergeants or Grenadiers of the regiment. While the privates of the Grenadier and Battalion companies were issued waist belts, everyone in the Light Infantry Company was issued a cross belt with a plate. "56 [light Infy buff] cross belts & plates ingraved, with Hatchett Cases, Bullet Bags & Bayonet Carriages complete" were purchased for the privates, along with "neat polished Hatchetts." The Light Company Sergeants were issued "[light Infy Sergt buff] cross belts & Tutge plates ingd" at the cost of 5s each. It is interesting to note that this is a departure from the 1771 Light Infantry regulations which stipulate that black leather waist belts with a frog for the bayonet and one for the hatchet is to be issued. The quoted items appear on a two page order placed by Messrs Ross and Gray with Alexander Mackintosh between June 6th and November 22nd, 1777. It is found in the papers of Lord Robert Bertie, Berkshire Records Office D/ED 037/1. The Battalion Company fusiliers carried their bayonets in a waist belt, which was often slung across the chest like a cross belt. 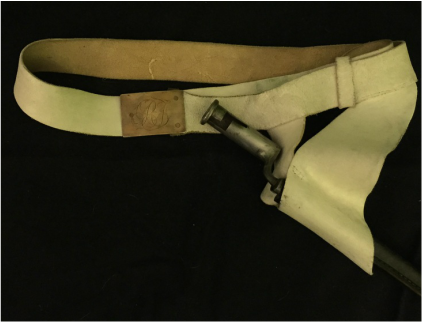 An example of the cross belt carried by the Privates of the Light Infantry Company. The cross belts of all of the regiment's Sergeants would have been very similar, but with a tutenag belt plate.